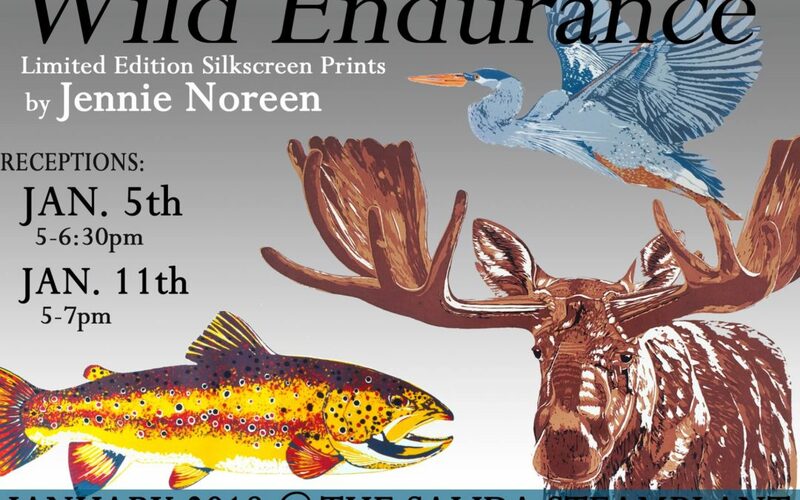 The SteamPlant Event Center will host “Wild Endurance,” an exhibition ofJennie Noreen‘s original silkscreen prints, in the Paquette Gallery from January 1 through January 31, 2018. The inspiration for my artwork undoubtedly comes from spending so much time on and around rivers, water, and in the wilderness. I grew up in Gunnison, CO and recently moved to Salida in part to pursue my passion for art. I create limited edition silkscreen prints of wild creatures using a reduction printing method. A sense of wild personality emerges through my process whereby each layer of color reveals a bit more of the subject’s character. The vulnerability of these animals to drastic change is paralleled by their sharp representation with bright colors on paper. The bold contrasts that bring these prints to life mirror the paradox of the wild creatures living in harmony and in discord with each other and the human race. Jennie Noreen focuses on native and endangered wildlife of the West. From native trout to the endangered and elusive Burrowing Owl to the bighorn sheep that populate tall canyon cliffs, the creatures on display represent a miraculous co-habitation of wildly different species. The playful nature of silkscreen as a medium brings a fun yet mysterious edge to animals on paper, giving them both life and personality at the same time. Jennie uses her medium as an expression of nature’s creative power and to draw awareness to endangered and threatened species. 15% of profits from endangered or threatened species prints are donated to river conservation efforts. Please join Jennie for an artist reception on Friday, January 5 from 5:00 to 6:30 pm in the Paquette Gallery. Free hors d’oeuvres, beer, and wine will be served. Join the Salida Council for the Arts and the Salida Creative District on Thursday, January 11 in the Paquette Gallery for a fine and festive social hour from 5:30 to 7 pm. Munchies are served, the cash bar is open, live music will be playing, Jenny will speak about her work, and you’ll hear news about the many creative projects being launched.